terms of throughput and latency over a strip of pervasive devices with short-range transmission capabilities. WiWi can be used to collect data from sensors along the path, thus acting as a virtual conveyor belt. simply not correspon ding to the natural node deplo yment. profitably used to collect data along the path. ized on tiny pervasive devices. capabilities and the app lication requirements. tions for future wor k.
(art. 21), Regione Friuli Venezia Giulia. 926 D. DE CANEVA ET AL. and optimized to achieve coverage and connectivity . efficient solution for this and similar problems. has been optimized on behalf of these main goals. chooses the best relay node among its neighbors. tions range of each node. become a real bottleneck for network performances. by alternating transmissions between adjacent nodes. and latency fit the application n eeds. 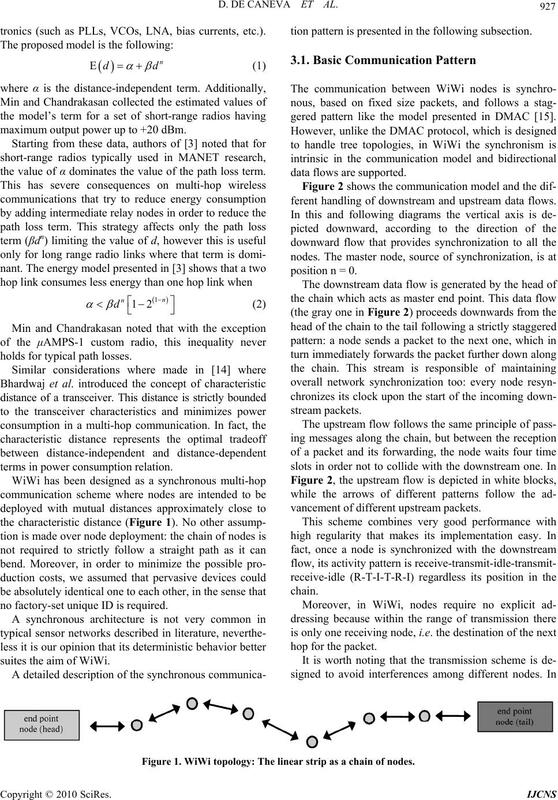 D. DE CANEVA ET AL. tion pattern is presented in the following sub section. tronics (such as PLLs, VCOs, LNA, bias currents, etc.). maximum output power up to +20 dBm. gered pattern like the model presented in DMAC . the value of α dominates the value of the path loss term. ferent handling of downstream and upstream data flows. holds for typical path losses. terms in power consumption relation. 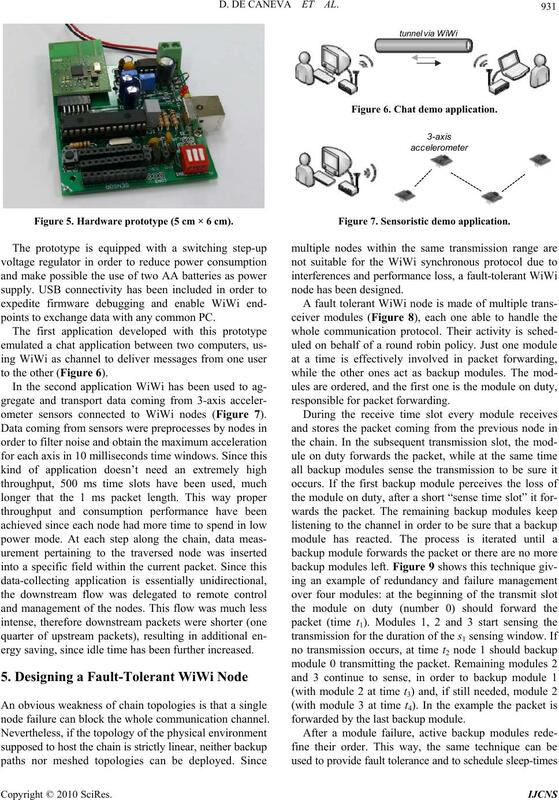 vancement of different upstream packets. no factory-set unique ID is required. hop for t he pa cket. Figure 1. 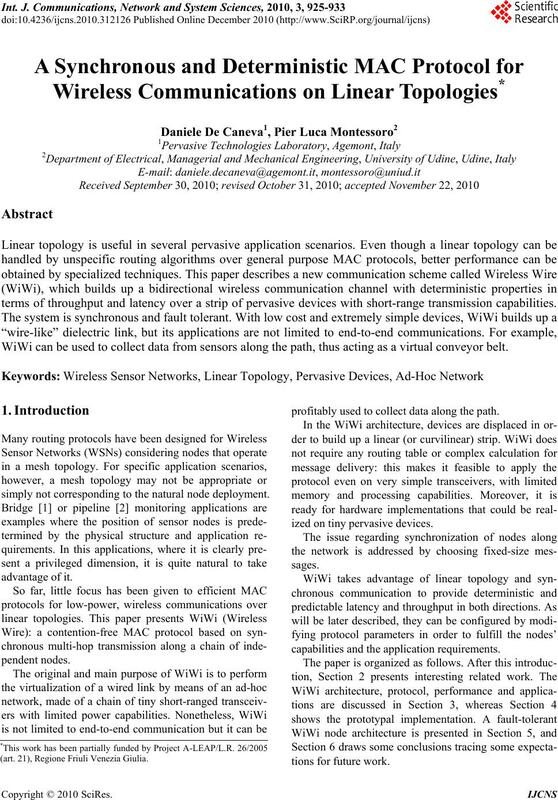 WiWi topology: The linear strip as a chain of nodes. 928 D. DE CANEVA ET AL. Figure 2. Bidirectional staggered transmission. a good resiliency from inter-node interference. 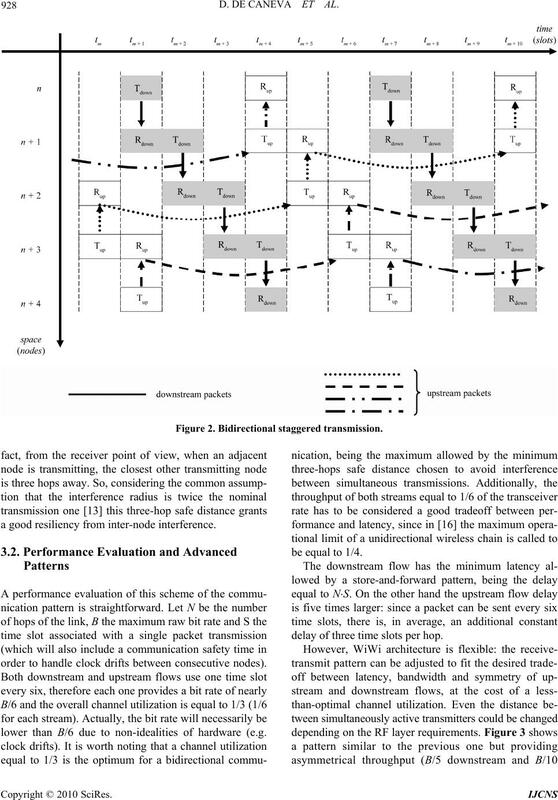 order to handle clock drifts between consecutive nodes). lower than B/6 due to non-idealities of hardware (e.g. delay of three time slots per hop. Figure 3. 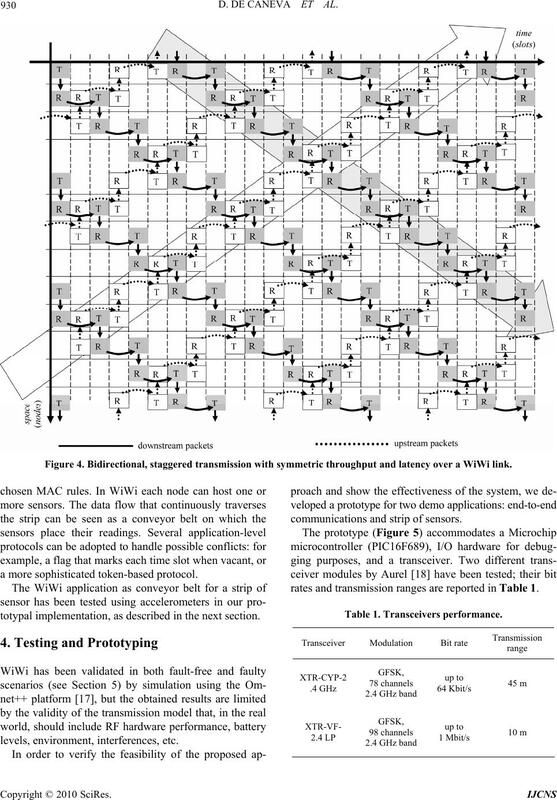 Bidirectional, staggered transmission with asymmetric throughput and latency over a WiWi link. channel utilization of 25%, whereas the latency is 2NS. instead of one single strip. 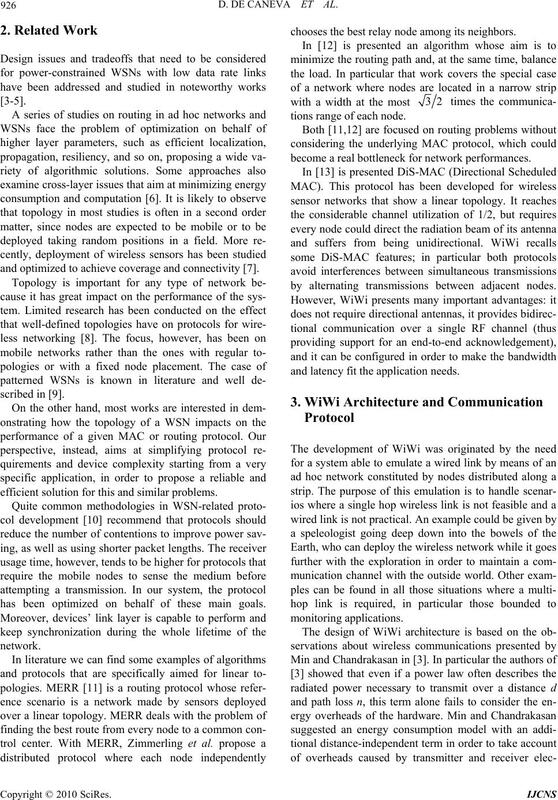 930 D. DE CANEVA ET AL. Figure 4. 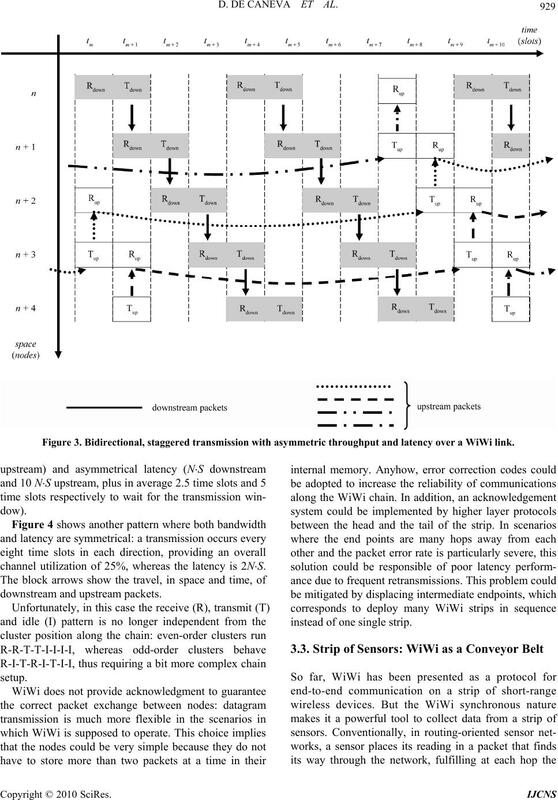 Bidirectional, staggered transmission with symmetric throughput and latency over a WiWi link. a more sophisticated token-based protocol. totypal implementation, as described in the next section. communications and strip of sensors. rates and transmission ranges are reported in Table 1. Figure 5. Hardware prototype (5 cm × 6 cm). points to exchange data with any common PC. to the other (Figure 6). ometer sensors connected to WiWi nodes (Figure 7). ergy saving, since idle time has been further increased. node failure can block the whole communication channel. Figure 6. Chat demo application. Figure 7. Sensoristic demo application. responsible for p a cket forwarding . forwarded by the last backup module. 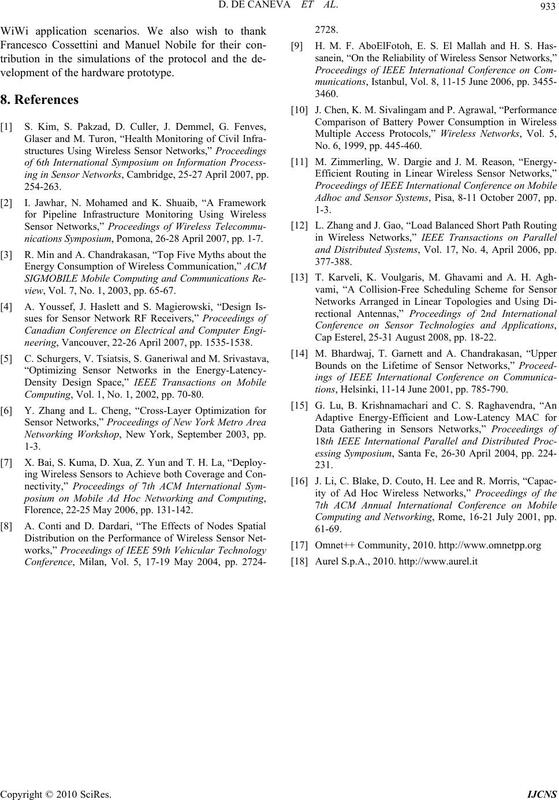 932 D. DE CANEVA ET AL. Figure 9. Redundancy mec hanism. for load balancing and energy saving. architecture, the other performance relations remain valid. Figure 10. Time slot components. and tested on hardware prototypes. ule stand-by periods and wake-up events to save energy. for them the optimal energy-saving schemes. velopment of the hardware prototype. ing in Sensor Networks, Cambridge, 25-27 April 2007, pp. nications Symposium, Pomona, 26-28 April 2007, pp. 1-7.
view, Vol. 7, No. 1, 2003, pp. 65-67.
neering, Vancouver, 22-26 April 2007, pp. 1535-1538. Computing, Vol. 1, No. 1, 2002, pp. 70-80. Networking Workshop, New York, September 2003, pp. Florence, 22-25 May 2006, pp. 131-142. No. 6, 1999, pp. 445-460. Adhoc and Sensor Systems, Pisa, 8-11 October 2007, pp. 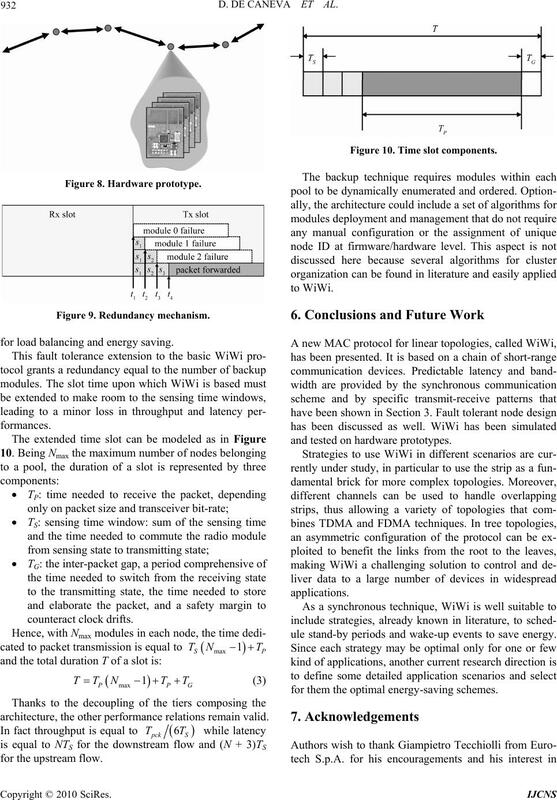 and Distributed Systems, Vol. 17, No. 4, April 2006, pp. Cap Esterel, 25-31 August 2008, pp. 18-22.
tions, Helsinki, 11-14 June 2001, pp. 785-790. Computing and Networking, Rome, 16-21 July 2001, pp.